Users call it go fast. Police and Oklahoma lawmakers call it a scourge. Whatever you call it, despite a decade of intensive legal battles, meth use in Oklahoma seems to be going nowhere but up. For some users though, the only place they go fast is down. Go down as in go to prison or, tragically, down for the count. 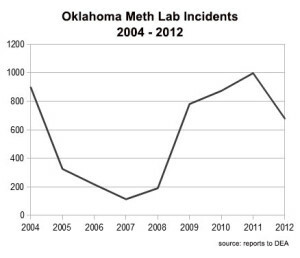 Law enforcement sources say Oklahoma methamphetamine lab seizures dropped dramatically in 2014. Yet the decline in seizures might not mean meth use has decreased – certainly not if the death toll is a measure of meth use. The number of methamphetamine deaths in Oklahoma is on the rise. The increase in deaths could be a result of the way meth users and meth dealers have reacted to recent enforcement efforts. In the past 10 years, Oklahoma has led the nation in adopting hard-line laws to control access to over-the-counter precursor drugs used to manufacture methamphetamine. While new laws reduced the prevalence of small-scale, portable meth labs, they may have also opened up markets for high-quality imported methamphetamine. A growing influx of high-potency methamphetamine from Mexico may be the reason for a growing number of fatal methamphetamine overdoses in Oklahoma. By the numbers, Tulsa County boasts a dubious title as the meth lab capital of the United States. Various police agencies reported 979 abandoned meth labs to the DEA’s National Clandestine Laboratory Register between 2004 and 2012. The number dwarfs those of runners up – with 474 labs reported in Jefferson County, Mo. and 393 labs reported in Oklahoma County, Okla.
Those are only numbers reported to the DEA, which leave room for error based on the consistency with which counties report labs. The abandoned lab list also omits mobile meth labs used by shake-and-bake meth cooks. That exceptionally dangerous shake-and-bake process involves inverting a container of meth ingredients, shaking it, then waiting until the process is completed – inside a pressurized container that might be nothing more than a plastic beverage bottle. Oklahoma Meth labs seizures in the most recent decade peaked around 2004 when Oklahoma was the first state to pass a law limiting sale of pseudoephedrine to pharmacy counters. Legislators in 2003 had criminalized possession of 24 grams of pseudoephedrine, with felony imprisonment of up to five years for possession of over-the-counter cold pills. Until then, meth making by many measures was a widespread cottage industry, with makers often preferring rural communities but willing to set up dangerous prodcution labs anywhere. Shortly after Oklahoma set a new regulatory benchmark, federal law moved all pseudoephedrine sales behind the counter. At the same time, Congress set in motion a tracking system that monitors pseudoephed sales to individuals nationwide. Dwindling availability of the methamphetamine precursor by 2007 may have led to the dramatic drop in Oklahoma meth labs, dumpsites and equipment reported to the DEA – a broader category than the abandoned meth-lab count in which Tulsa Count leads the nation. In 2007, the number of Oklahoma lab seizures hit a low mark, with only 114 reports statewide compared to 899 reports in 2004. The numbers crept back up to previous highs during the next five years. 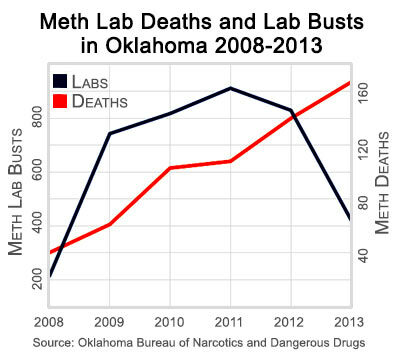 By 2012, Oklahoma reported the fifth highest number of meth lab seizures nationwide – 678. That number was on the backside of a second peak in 2011, when 997 lab incidents were reported. The second peak may have been driven by larger numbers of smaller labs. Downsized meth labs could produce meth out of ever smaller quantities of cold-pill precursors. The new production methods followed the new regulatory regime. It may be impossible to say whether Mexican super-labs or Oklahoma’s new meth laws drove shake-and-bake speed labs out of business. In 2013, new Oklahoma laws further reduced the amount of pseudoephedrine a person could possess to 7.2 grams. By then, the state had joined the national exchange to track over-the-counter pseudoephed sales across state lines and limited daily sales to 3.6 grams per person per day – about 15 cold pills. Meth nonetheless continued to be a drug of choice for many in Oklahoma. Mexican superlabs such as those fictionalized on the popular TV series Breaking Bad provided cheaper meth to dealers without the exposure of purchasing supplies in drug stores. The imported meth was more pure and more potent. Deaths followed. The Oklahoma Bureau of Narcotics and Dangerous Drugs reported 167 people died of methamphetamine-related overdoses in 2013, up from 140 the previous year. Meth lab seizures in 2013 were only about half the number seized the previous year. Meth is big business with dangerous results for those involved. Fighting meth is also a big business with dangerous results in the Oklahoma criminal justice system. Stringent laws mean more innocent people are likely to be caught on the fringes. Parents caught with too many cold pills can be prosecuted as felons. Innocent merchants stopped on the highway with too much cash may have their money seized until they can show the cash is not related to criminal activity. Prosecutors can be relentless and penalties can be severe. If you have been caught up in Oklahoma’s drug war and are facing criminal charges, you need zealous criminal defense. For defense against methamphetamine charges or any drug crime in Tulsa, Oklahoma, contact an experienced Tulsa drug crimes attorney. For a free consultation with a Tulsa criminal defense lawyer, call Wirth Law Office at (918) 879-1681 or send a question using the email form on this page.